NETWORK FINALS: After time-zone adjustment, FOX’s NFL PLAYOFFS game adjusted to 13.4, down 2 points from last year’s primetime game, and THE RESIDENT adjusted to 2.6. Elsewhere, the 10PM SHARK TANK lost 0.1. CABLE HIGHLIGHTS: It was a night of simulcasts for TBS and TNT. Both aired the SAG AWARDS, respectively at 0.41/0.36 (way down from last year’s 0.57/0.60), then they both aired what was billed as a “preview” of THE ALIENIST, with the pilot to be re-aired as the official “premiere” on Monday. The Sunday runs were respectively at 0.19/0.16. In addition, Starz’s COUNTERPART, which had itself “sneaked” on-air a few weeks ago, had its official premiere at 0.09. Adult Swim’s ROBOT CHICKEN topped the night’s scripted efforts, up 0.06 to 0.62, with HOT STREETS at 0.43/0.35, compared to last week’s 0.42/0.41, and SUPERMANSION down 0.09 to 0.24. 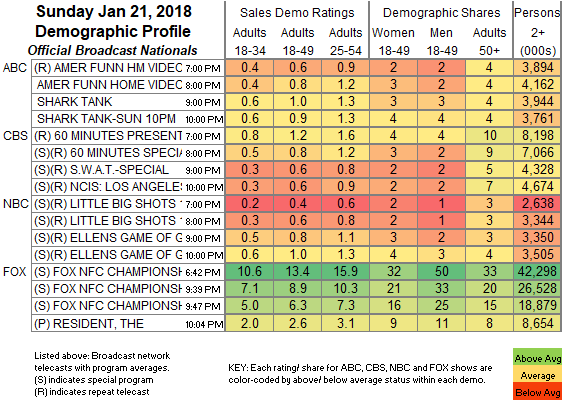 On Showtime, SHAMELESS was down a tick to 0.54, with THE CHI up 0.04 to 0.24. On HBO, DIVORCE dropped 0.06 to 0.16, and CRASHING was down 0.03 to 0.15. Bravo’s REAL HOUSEWIVES OF ATLNTA won the night, down 0.07 to 0.89, with lead-out TO ROME FOR LOVE at 0.33. On E!, KEEPING UP WITH THE KARDASHIANS fell a heavy 0.16 to 0.53, and REVENGE BODY was also down 0.16 to 0.21. 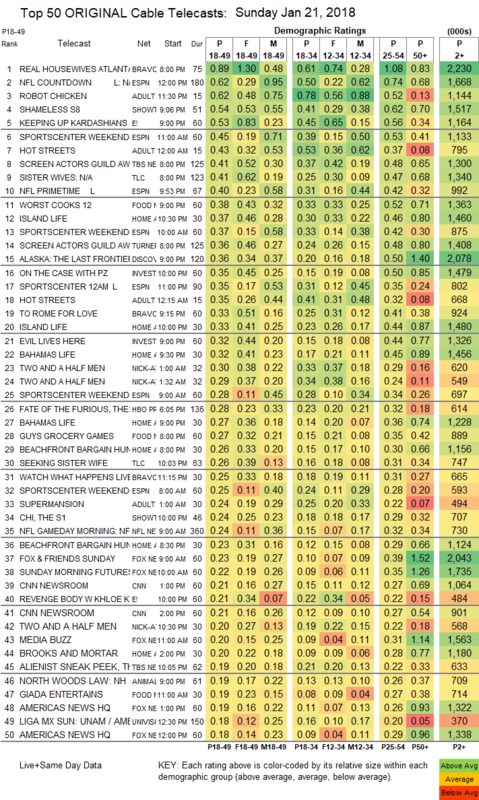 On TLC, SISTER WIVES was steady at 0.41, and SEEKING SISTER WIFE was down 0.05 to 0.26. On Food Network, WORST COOKS IN AMERICA collapsed by 0.19 to 0.38, and GUY’S GROCERY GAMES was down 0.07 to 0.27. HGTV’s line-up was led by ISLAND LIFE at 0.37/0.33, compared with last week’s 0.38/0.37. Discovery’s ALASKA: THE LAST FRONTIER was at 0.36, compared with last week’s 0.39. On ID, ON THE CASE returned at 0.35, and EVIL LIVES HERE was down 0.04 to 0.32.